Fregonese Associates led the team to develop a Comprehensive Plan for the City of Irving, Texas. The team conducted extensive outreach and public involvement efforts in the economically, socially and ethnically diverse community. The plan focuses on the City’s centers, corridors and connections and on supporting healthy high-quality places for community members to thrive for generations to come. 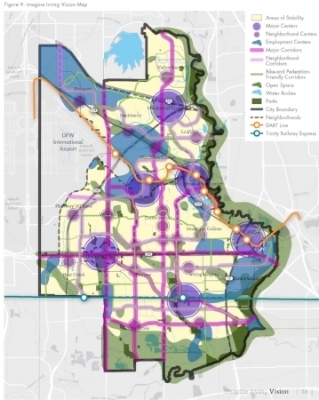 In addition to including housing, transportation, land use, economic development and open space recommendations to guide the Dallas suburb for the next 30 years the plan included Planned Unit Development guideline document. The image of the Imagine Irving Vision Map illustrates a starting point for developing the Comprehensive Plan, and a guide for future decision-making and planning. Ultimately, it guides the zoning ordinance and other programs required to implement them. The vision map shows the major building blocks that structure the city’s continued growth and reinvestment through major centers and corridors.